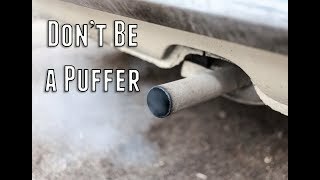 Puffing refers to the practice of leaving your car running unattended. When it gets cold, it may be tempting to warm up your car while you are not in it, but it is against the law to do so in Arvada. The only exception is having a remote start system on the car. The key may not remain in the vehicle. In addition to being illegal, puffing can result in you being a victim. Items may be stolen from your vehicle. Stolen personal identification items could lead to identity theft. Your car could be stolen and used in other crimes. This ticket requires a mandatory court appearance.